No, that's not a made-up headline. Which is all well and good. Merry even. I got the joke. Some of the women look younger than him, so he shouldn't be calling them "makcik", which means "aunt", according to Google Translate. But I also looked up "kakak" and "adik", and they mean "older sister" and "younger brother" respectively. Then isn't calling the women "kakaks" pretty much the same as calling them "makciks"? And the only man in the picture who could be a "younger brother" looks like the PM's bodyguard. No, wait. That's Ho Ching. I'm kidding! Please don't deport me. And "kakaks" probably refers to the women in the picture who are older than him. 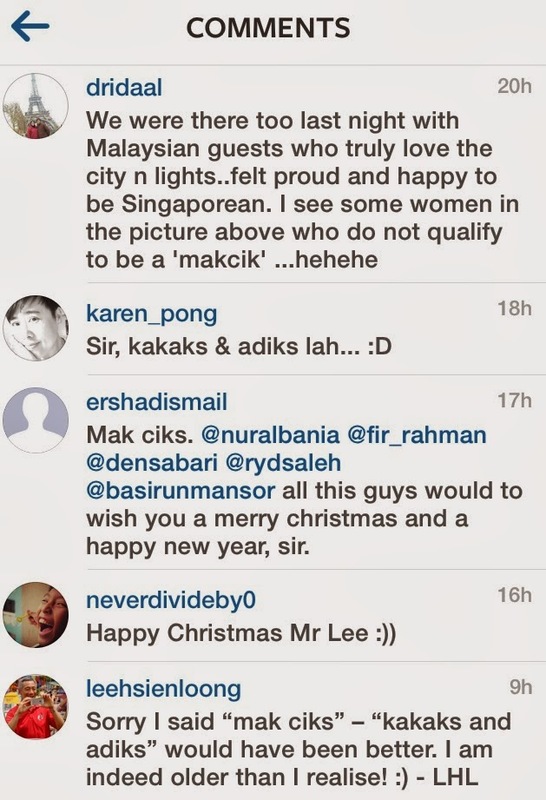 Good thing he didn't call them "pak cik".